The establishment barks “cherry-picking” at skeptics who claim a particular year was cold, or quiet, or less stormy, but where are the caveats when the mass media churns out record single “hot year” headlines as if they matter: 2010 is hottest year EVER! What’s not obvious is that breaking those records depends on the data set. According to satellite data there have been no “hottest year ever” records since 1998, though as it happens, NASA doesn’t seem too keen on using data recorded from space. Go figure. With ground stations, every single station requires hand-made “adjustments” and many stations are ignored completely. The results from ground stations are “interpreted” to cover anything from zero kilometers right up to 1200 km. I guess, only a God of Science would know which thermometer has that magic-1200-gift. Meanwhile, the satellite records are a massive collection of data recorded continuously 24/7, year after year and covering all round the globe, land and sea. Part II of this series is about those “adjustments” and the different data sets. [A series of articles reviewing the western climate establishment and the media. They “adjust” the raw temperature data to increase apparent warming. This is under the guise of filling in missing data, accounting for thermometer moves, accounting for the urban heat island effect, and various technicalities. The effect is to substantially increase the warming trend (US and global, Australia). In the country with the best thermometer network, the USA, the official adjustments account for almost the entire temperature rise from the 1930s to the 1990s (from NOAA data, here). They revise the official (adjusted) temperatures after a decade or so have passed, to increase recent warming and remove any recent cooling. For example, 1965 went from being 0.3°C warmer than the 1970’s in 1976 to 0.03°C cooler by 2007, presumably to erase the cooling period around 1960 – 75 when human carbon emissions were increasing rapidly. They hide their temperature data, both their raw data and how they adjusted it. They evaded Freedom of Information (FOI) requests to make the data, which is publically owned data, available. They even claim to have lost original data! Why would the climate establishment play these tricks, if their case and data were strong? Don’t these tricks strongly imply that their case is weak or wrong, and that they know it? What Difference Do Their Tricks Make? 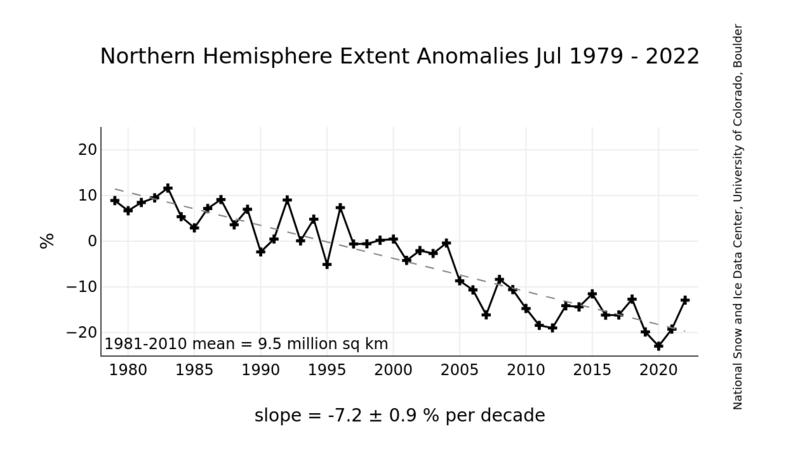 Figure 13: From the Goddard Institute for Space Studies (GISS) at NASA, run by Jim Hansen, the “father of global warming”. (In 2009 Hansen endorsed a book which claims “The only way to prevent global ecological collapse and thus ensure the survival of humanity is to rid the world of Industrial Civilization.”) From land-based thermometers (such as those in Figure 1 – 12) and a few ocean thermometers, but no satellite data (despite the “Space” in GISS). Same timeframe and format as the satellite data in the next figure, for easy comparison. Source (updated monthly). The warmest year appears to be 2006. The warming trend appears to continue through 2010. But there is an alternative method of measuring global temperatures—with satellites. Satellites measure the temperature 24/7 over broad swathes of land and ocean, across the whole world except the poles. While satellites had some initial calibration problems, those have long since been fully fixed to everyone’s satisfaction. Satellites are mankind’s most reliable, extensive, and unbiased method for measuring surface temperatures. Figure 14: Satellite data from the University of Alabama in Huntsville (UAH), using the NASA AQUA satellite. Same timeframe and format as the land-based thermometer data in the previous figure. Source (updated monthly). The warmest year was 1998. A generally rising trend until somewhere around 2001, then a levelling off (or slight cooling). A large El Nino spike in 1998. During an El Nino, surface temperatures are high for about a year then come back to their previous level. A large El Nino spike in 2010, that peaked in January to March and is now (Sept 2010) presumably on the way back down. Obviously this has different political implications from the land-based thermometer data. The satellite data is inconvenient to the climate establishment, and they never refer to it. But they appear to have a strategy for dealing with it in the future: they underfund the temperature satellites and do not fix flaws as they arise. “from 1995 to the present there has been no statistically-significant global warming”. Jones also noted that it has been cooling since 2002, but that this trend was too short to be statistically significant. 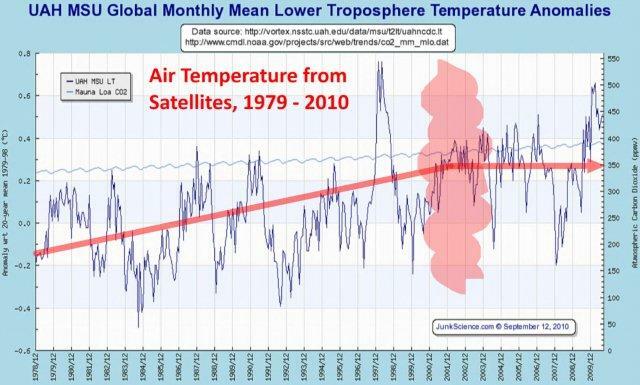 Their thermometer tricks create the picture of ever-rising temperatures that they need politically, but contrasts with the superior and unbiased satellite picture that shows global warming paused around 2001. Why do the climate establishment use the land- thermometer temperatures in their communications with the public, when they could use the satellite data instead? 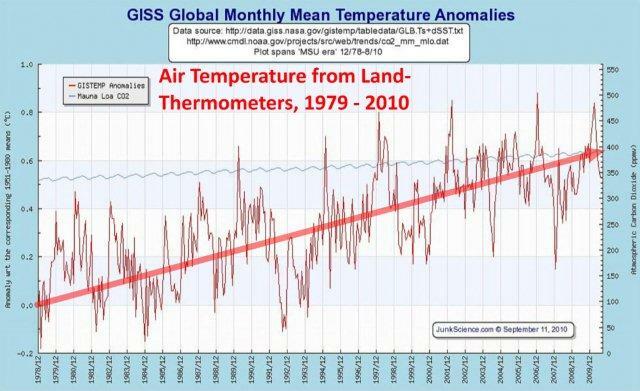 They have tacitly admitted their land-thermometer data is deeply flawed by setting up a new network of properly sited thermometers (which won’t report for 50 years) and by ceasing to use individual thermometers that get ridiculed on the Internet. Obviously this goes beyond mere incompetence. Summary | PART I | PART 2 | PART 3 | PART 4 | PART 5 | PART 6 | PART 7 | PART 8 | PART 9 | PART 10 | PART 11 Full PDF versions for printing and emailing are available from the summary page. Of course. The reality to be addressed is: what can be done about it, and just how to go about that. The majority of the population unfortunately don’t ‘get’ the graphs and the science, because they do not understand-and should not be expected to understand-complex scientific arguments. People are looking for quick internet grabs of some 30 seconds. Are you going to convince them with scientific logic within that time slot? Marketing and PR are the weapons of the client establishment, and their ‘hit’ is quick and attention-grabbing. I think it’s about time the AGW sceptic scientific community realised the power of this weapon. There remains a general misunderstanding about this issue that should not be perpetuated. Because anomalies are taken of temperatures it is not whether the temperatures are in warmer or cooler areas that is the issue here. Rather it is the rate of increase in temperature that is the important factor. As it happens the missing thermometers tend to be in the rural areas where the rate of increase in temperature is much smaller than urban areas or those close to airports. This is more subtle than whether the thermometers are in hotter places but just as important. Here is the latest MSM cherry-picking of temperature data in U.S.
Well since they’re all laughing at kids getting blown to smithereens covering friends with gore, of course they’re bloody corrupt. The problem with thermometers is that they measure the average temperature of the local air molecules. Over 100 years ago Maxwell and Boltzmann made a statistical analysis of the kinetic energy of the molecules in a gas and produced their energy distribution curve for a unit volume of gas at a fixed temperature. This analysis is still widely used today in physics and chemistry. What happens as the temperature reduces is worth noting. Especially if you insert an energy reference point: such as the lowest kinetic energy required by a CO2 molecule to emit a photon. The expression ” lies, damn lies & statistics” needs appending to include climatology. No wonder it has so much popularity with politicians looking to get elected & then take our money. You say it like it’s a bad thing. There’s nothing wrong with playing tricks (nudge nudge, wink wink). As the various climategate whitewashes inquiries showed us, tricks (nudge nudge, wink wink) are just innocent technical colloquial terms that scientists use all the time. You know, like Mike’s Nature trick (nudge nudge, wink wink). It’s ok to play these tricks (nudge nudge, wink wink) because the science is settled. It looks as if there is a crack in the wall starting in New Zealand. The interesting thing is that if air temp records globaly were to be declared corrupt the whole AGW argument fails completely! How did they fool the sea ice? It’s no wonder the alarmists have to play their silly exaggerate the air temperature games. They can’t find any build up of heat in the oceans. There is no tropical troposphere “fingerprint“. We can easily measure heat radiating out to space like it always has. Since alarmists Hansen, Jones and Karl control all three land temperature measurements, it’s the best choice they have. “Missing” data resulted in GISS erroneously increasing the average mean temperature for Spring 2009 by as much as 1.1 degrees above the real temperatures recorded by BoM for Esperance, Kalgoorlie and Perth Airport. The maximum daily meteorolgical temerpature is set by the warm air convection that originates from the surface 1.5 to 2 meters below the meteorological thermometer (the surface fetch length depends on wind speed and direction). The factors that produce more warm air convection from the surface are more sunlight, less moisture (evaporation) and a higher surface absorption (tarmac etc.). No only has ‘cherry picking’ selected the warmer weather stations, is has also selected those that are more susceptible to solar surface heating under the right weather conditions. Instead of just looking at the min/max and average temperatures, can we get enough information to look at the surface energy transfer and determine the convection from the surface flux terms? The instrumentation and the computing power is readily available. Do we really need to spend money on those satellites and supercomputers when the meteorological stations are still in the dark ages? The climate astrologers that still use radiative forcing for their predictions have no interest in letting reality interfere with their religious beliefs, or their income. Just keep on throwing money at the Great Global Warming Altar and believe in the Divine Environmental Myths. The great CO2 comet has appeared in the sky and the world is coming to an end. The Climate Gospel according to Computer has predicted it. These number-changing scientists monkeys have done such a disservice to science that it will take a generation to regain its credibility….starting from when they finally admit to the wide scale corruption of the temperature record. I wonder how some of them can sleep at night! The problem was Jim Salinger, he was a man with a mission. From what I understand, he “owned” the NZTR – it was his “precious” (allusion here to Lord of the Rings). He is no longer involved in any capacity at NIWA, and has been replaced by John Morgan. I have met John. He is a very capable man, and I have a lot of respect for him. But what to do when you have an “official record” that turns out to be a crock of manure? Since it is rubbish, better to say, “Yeah, well, forget that, we [post Salinger] are not responsible for it [i.e. not responsible for the state it is in], so it is not [as in no longer] an official record”. Of course, to be fair to Jim Salinger, he would have been taking direction from the Minister of the day, and since the Minister (or series of Ministers) are those who put their hands up in Cabinet for the portfolio, he would simply have been providing what he interpreted their policy to be. He was just perhaps a tad over-zealous in doing it. In the climate controversy dubbed Kiwigate, New Zealand skeptics have inflicted a shock courtroom defeat on climatologists implicated in temperature data fraud. The specific charge brought against the Kiwi government was that it’s climate scientists had taken the raw temperature records of the country and then adjusted them artificially with the result that a steeper warming trend was created than would otherwise exist by examination of the raw data alone. The original Kiwi records show no warming during the 20th century, but after government sponsored climatologists had manipulated the data, a warming trend of 1C appeared. Anyway, in the case of New Zealand, judge for yourself! Watch this vid to see what they predicted the sea ice would do, then ask your question again. Satellites measure TOA outgoing long wave radiation. Great. Problem is people seem to think outgoing must balance incoming. If this was a dead planet then it would balance. But this is a living planet. Huge amounts of sunlight are absorbed by plants and phytoplanktons to enable their natural growth. This energy is being stored during every hour of sunlight but does not seem to be included in the energy budgets. Think of all the energy from sunlight that produced the coal fields and the chalk beds like the White Cliffs of Dover. Also if we had no CO2 we would have no oxygen. It seems to me that the only way to get these people to behave ethically is through the courts. Kiwigate may be just the start and although slightly different Univ. Va and Michael Mann are coming under strong pressure. If there were nothing to hide full disclosure of data, codes (marks if you show your workings -:) etc would and should be automatic in publicly funded science. In the meantime our scientifically ignorant politicians and advisors are sending down the road of economic suicide. So sad. Those dishonest, cheating, climate scientists (and they should be ashamed to use the title – but they have no shame) will stop at nothing. Fiddling thermometers, fudging data, re-writing history – they will stop at nothing. Lucky that there is a satellite temperature record to keep them honest! Well no, there hasn’t, simply because 15 years is too short a period to look for such things. If you wait until 2025, the warming since 1995 will be statistically significant. Look at either graph (satellite or land-based temperatures), from 1987 to 1996. The temperature over this period looks either flat or decreasing. And yet it keeps on warming. Placing a dot in 2001, and dividing the plot into a “before” bit which is increasing, and an “after” bit which is not, is just plain stupid. It is much more sensible to just fit one straight line (increasing) through the whole of the available data. It is much more sensible to just fit one straight line (increasing) through the whole of the available data. So John; Draw a straight line through this data for me (NOAA ice core from Greenland). What do you conclude from that? See the little blip on the right end? (Yeah, the one that ends with a temperature significantly below the average of the last 10,000 years.) That’s the temperature record you want to model with a linear function. Here’s the record for the last 50,000 years: Draw a straight line through that (it’s the right thing to do, after all — J.B. said so!) Hey! Temperatures have been rising (modeled by a linear fit) for the last 50,000 years! Who knew that Humans could have an effect even when they were scattered bands of hunters? Better shut down civilization (or at least, give the power to do so to the envioros, else they’ll kill your children). So John: We’re all dying to know — exactly where is the best place to start the linear fit? Oh, that’s right, you said “…through the whole of the available data.” Guess you’ll have to start at 400Kya or so. Anything else would be cherry-picking. If you wait until 2025, the warming since 1995 will be statistically significant. Well, there you have it. If only we had your secret sources of information, we would all see the Light, but since you won’t share, we’ll just have to believe you. Why I bet you could draw the above linked temperature graphs offhand, just using your superior understanding of what is going on. Here’s the record for the last 50,000 years — lost the link in previous post. Want to reconsider your opinion that it would be “…just plain stupid. (to not) …fit one straight line (increasing) through the whole of the available data.” ?? Otherwise, you could let us know what scientific reasoning shows a linear fit is the best model? Don’t waste time with Brookesy, he’s got his Mannian algorithm powered crystal ball and that”s all he needs. Hey BobC, don’t be so mean to me! You don’t have many good trolls on this site, and lets face it, you need trolls to make it interesting…. Anyway, I suppose I should follow your lead and use ice cores from Greenland rather than global temperatures. No, wait, it is global temperatures we are interested in, isn’t it? I’ve often wondered why we get those 100,000 year cycles. Not the timing, but the size of them. The temperature difference seems just too big. Particularly on your last graph, BobC, the vertical axis goes from -55 to -30, just what is that scale? On a serious note, both your graphs are for long time periods. The vast majority of 20 year periods chosen from either graph would be best modelled by a linear function. Certainly neither graph that Jo supplies justifies anything more than a linear approximation. And I bet my crystal ball is better than yours. In particular, I bet that by 2025, there will be statistically significant warming from 1995. All going well, I will be alive in 2025…. You make a good point — but mean is what I’m called on warmist blogs — this was mostly humor (at your expense, true). Still, I’ll try to moderate it. Its not unreasonable to assume that, if Greenland and Antarctica anomalies agree, they are probably representative of the global anomaly. On a serious note, both your graphs are for long time periods. The vast majority of 20 year periods chosen from either graph would be best modelled by a linear function. OK then; Let’s model Global Warming with a linear function. Let’s see, it started with Hansen’s testimony to Congress in 1988. Oops! Time’s up! Time to start another linear trend — and this one is flat to down. Seriously, then, here’s a shorter section of the Greenland core: There are long (200-400 years) segments that could be modeled well enough with a straight line fit. For example, the “Global Warming” that took place between 800 and 1000 AD makes the current rise look like a molehill. It also shows why the Vikings could farm Greenland then, and today their farms are under ice or permafrost. And I bet my crystal ball is better than yours. In particular, I bet that by 2025, there will be statistically significant warming from 1995. I don’t know how to predict the Sun (I’m not sure anyone really does), but I’ll bet on this statement: If the Sun doesn’t wake up soon, there is no chance of statistically significant warming in 2025. We will be looking back at this decade with longing for the warmth. BTY: The scale on the graphs is the temperature in Celsius on top of the Greenland ice sheet — pretty cold. It’s not the absolute temperature that is interesting, however, but the changes (as the warmists never tire of telling us about the thermometers sited near runways and air conditioners). The other one that they are clinging to is that 2010 is technically the warmest year on instrument records. Of course they skim over the fact that the temperature trend has totally parted company with the 30 year PDO trend, and all climate model predictions and is in fact on track to pass back below the multi-century trend in about 2015. I then reply the first step is precisely identify the problem, give us a precise description and location of a problem and we can start to work on a solution to it. You can’t correct a problem that you can’t accurately identified otherwise you are just engaging in hand wringing. Given some of the dramatic weather events of the last year. With the breaking of the Australian drought, and record snowfall across the northern hemisphere. If I was the God botherer type, I would say that the Almighty has definitely stepped in to demonstrate that he controls the climate of us mere humans. It’s amazing how hard it is to proof read your own writing and I think using voice recognition makes it even harder. That should have read – CO2 by itself CAN’T cause enough warming to create a disaster,AND the current trend shows that. Given the multi-century trend, that would at first appear to be a fairly safe bet. But I wouldn’t be too sure, history shows us that we are entering a period of either flat or slightly declining temperatures until about 2030. Whether they will decline below the 1995 levels by 2025, or not, is anything but a safe bet.